ISKCON Bangalore is a charitable society with the objective of propagating Krishna Consciousness all over the world, as explained by Srila Prabhupada, whose teachings are based on Bhagavad-gita and Srimad Bhagavatam. The society was registered in the year 1978 under the Karnataka Societies Registration Act, 1960. The objectivess of the society are derived from the Seven Purposes of ISKCON as stated by Srila Prabhupada. In 1987, the society was operating from a rented house in Bangalore. 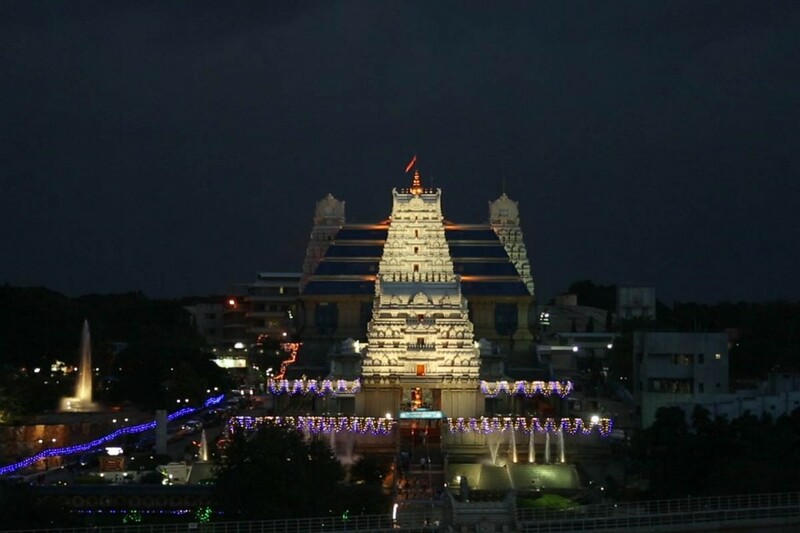 In the year 1987, the leaders of the society applied to Bangalore Development Authority (BDA) for allotment of land to construct a grand temple and cultural complex. The land was allotted on August 3, 1988 – a seven-acre hillock, which was nothing but a huge piece of monolithic rock that could not be converted into sites. The BDA described it as “karaab land” (waste land). A temporary shed was constructed to set up a make-shift temple and the Deities of Sri Sri Krishna Balarama moved to this shed on the appearance day of Lord Balarama (September 1988). Sri Madhu Pandit Dasa, the President of the ISKCON Bangalore Society, is a qualified civil engineer from IIT (Mumbai) and applied his knowledge to conceive a wonderful temple for Krishna with the help of Sri Jagat Chandra Dasa (a devotee who was also an architect and product engineer from IIT–Mumbai). The unique combination of glass and gopuram represents a fusion between majestic traditional styles and bold new aesthetics. The original simple temple design started in 1990 estimated to cost Rs.10 crore gave way to a more stunning, unique architectural model that cost Rs.32 crore. The construction started in 1990. Six hundred skilled craftsmen spent more than 10 million man-hours to construct this architectural wonder. 32,000 cubic meters of stone, 131,250 tons of cement and 1,900 tons of steel were used in the construction. Subsequently the temple construction was completed in 1997. The temple and cultural complex was inaugurated by the then President of India, Dr. Shankar Dayal Sharma on May 31, 1997. It gives me immense pleasure to associate myself with the inauguration of this Center for Advancement of Culture of International Society for Krishna Consciousness (ISKCON) here in Bangalore. This magnificent complex, a blend of tradition and modernity, is a symbol of the dedication and devotion of ISKCON to the cause of bhakti and service. It is an architectural landmark. I congratulate all those who have worked tirelessly to set up this splendid edifice.